Curators collect, exhibit, interpret, maintain and protect objects of historical and aesthetic importance primarily in museums, libraries and private collections. Most curators specialise in a particular field, such as botany, art, palaeontology or history. Curators are responsible for the safety and proper presentation of the works. overseeing research on collection pieces to make certain the integrity of the piece is maintained (such as dating tests for fossils, or X-ray analysis of paintings to determine origin). Another facet of the curator’s job is educating the public about the objects and publicising their existence. Palaeontologists unearth and study fossils of extinct species of plants and animals. They conduct research on prehistoric life forms and the evolution of plant and animal life. Invertebrate palaeontologists study the fossils of animals without backbones. Why did you choose to be a palaeontologist? It was my honours year at UCT and I was still uncertain as to which field in geology I would pursue. Geology provides various sub-disciplines; invertebrate palaeontology is one of them. My honours project required me to study the remains of small, strange little marine organisms called foraminifera. I was intrigued and immediately developed a keen interest in the study of creatures that lived millions of years ago. What training did you do? I completed my Honours in Geology two years ago from the University of Cape Town and am currently doing my master’s degree. Is there a type of personality best suited to this work? 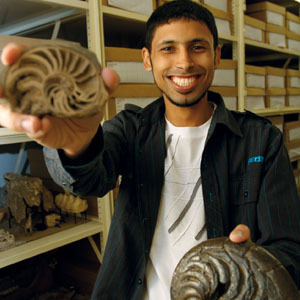 Palaeontologists are passionate about fossils. Our work requires dedication, and seeks to answer questions about animals and extinct species that lived millions of years ago. Describe a typical day at the museum Few days are the same and this is also what makes this profession interesting. I look through the fossil collections – ensuring they are updated, do work in the laboratory, present lectures to students, and consult on fossils that members of the public have made enquiries about. Certain days also require that I undertake fieldwork. What do you enjoy most? Unravelling the secrets of a fossil that have been kept hidden throughout millions of years. Experience versus formal training? Palaeontology is a very hands-on profession. Formal training provides the foundation on which experience is built. What’s been the highlight of your career thus far? When my research output proved to be valuable to an offshore mining company. What are your goals for the future? My immediate goals are to complete my MSc and PhD degrees. I envisage the establishment and expansion of invertebrate palaeontology at certain universities to encourage and expose students to it. I would also like to see and be actively involved in an exhibit on the evolution of invertebrate animals through time. What advice would you give to someone starting out in your field? Invertebrate palaeontology is not a monotonous career. It can be used in various fields of study such as geology, entomology, zoology, etc. In this line of work you will grow in what you do; every day is about learning something different. Although some curator jobs require only a bachelor’s degree, many employers require curators to have a master’s degree in an appropriate discipline, combined with related work experience. To become a palaeontologist, a strong background in the sciences is absolutely essential, with strong concentration in both biology and geology. A Bachelor of Science degree, followed by an honours degree is the minimum qualification required to register as a professional scientist with the South African Council for Natural Scientific Professions. A National Senior Certificate that meets the requirements for a degree course is a prerequisite for these courses. Abilities in statistical analysis and solid computer skills are also absolutely required in modern palaeontology.